It was late the night a young farm girl named Solie slipped away from her family farmstead in the kingdom of Eferem to avoid her father's insistence on an arraigned marriage. The innocent seventeen-year-old ran towards her aunt, the one woman she knew who may understand her plight and assist her in getting away. Solie didn't make it. Before she even got close, she was kidnapped by the king's men, bound and carted off to castle. Her arrival was witnessed by an air sylph master named Devon, grim with understanding as he stood waiting to do his job and full of pity for the unknown girl who would lose her life so a deadly and fearsome battle sylph could be bound to the prince. As the air ship he was waiting on finally arrived, and Airi, his air sylph, went to help the ship land, Devon was exposed to even more dangerous information. The wounded ship carried two battlers and their masters. The king had sent them together to fight someone or something, and that alone was rare enough to have made him wonder...if it hadn't been for the fear. Devon was too petrified by the hate spewing from the battlers to dare question the events of the night, and even if he had, it wasn't likely the battle sylph masters would deign answer him. Then again, even with the cold facts it's doubtful Devon would have had the first clue that before the sun rose on another day, his life in Eferem would be over. Soon enough he would realize that his reality was about to alter dramatically...and forever...and his future was aligned with the shocking destiny of one young girl who will be queen and the battle sylph who loves her. 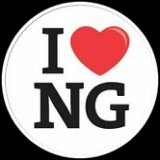 As a long time and ravenous reader, I've always understood that there are and will always be books that I love, books that I loathe, and a majority that fall somewhere in between. Occasionally, though, there are books like The Battle Sylph, books that go beyond that scale and garner a much rarer response. They excite me. The Battle Sylph isn't a perfect book. It had characters that I wasn't crazy about. Solie, and to a lesser degree Heyou, annoyed me with their youth and inexperience and left me wondering at the intended market for the series, because I kept getting a Young Adult vibe from both of them that set my teeth a little on edge. Solie is, after all, only seventeen and Heyou described as very young for his kind. Fortunately, this fantasy book features an ensemble cast instead of offering them up as the two lead characters, so my irritation with Solie and my occasional exasperation with Heyou was muted by a few characters who really shined. I adored Ril and Leon, loved their backstory (while tragic and horrific in parts, it was powerful and intense), their conflicts, and their relationship development, and was captivated by each of them as characters - both solely and together - as their situations evolved through the book. Mace was fantastic. There was something about him I found particularly compelling, though he had less angst around him than Ril did. Galway and Devon were also nice characters who added much to the story, and I can't help but hope that we see more of Thrall in the future. And that Claw finds some peace. Okay, I admit it...I'm a sucker for the battle sylphs. Back to the book. Like I said, not perfect. Besides the characters, I also had had some issues with the story, and felt it lacked a little complexity in the plot conflicts as the world was being developed and fleshed out. With fantasy favorites including such notables as Anne Bishop's Black Jewels and spanning back to my younger days with Mercedes Lackey's Valdemar and Piers Anthony's Xanth, complexity of plot and creativity of world building has to go pretty far to make an impact on me. While I liked what McDonald put forth in this debut, I think there were aspects that could have been more clearly defined and widely expanded in both world and story. The Battle Sylph excited me. It did. Unlike some widely popular fantasy heavy hitters that inundate a reader with complex political intrigue and mind-melting social and cultural minutia, which I tend to find a bit overwhelming for various reasons, I found the book eminently readable with its casual and contemporary narrative, and thought the world created around the story was unique and original. 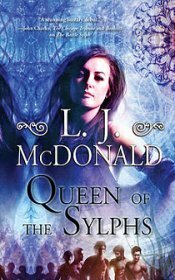 I love the idea of the sylphs, the concept of a patriarchal feudal society in which women are little more than pawns and chattel, easily expendable and too forgettable when it comes to snagging powerful warriors from another dimension to serve a corrupt monarchy, only to have the true nature of the sylph and their relationship with women indicative of something else entirely. There's lots of potential for fantastic conflict there as the growing awareness of the truth demands a massive paradigm shift and huge change in the traditional power structure on a fundamental level. All of those heady points left me hungry for more of the fascinating world and the characters I fell in love with. More than that, though, they left me excited for a new series that may not be quite as layered and complex as some of my fantasy favorites just yet, but definitely has the potential to be so. 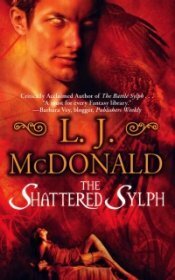 I can't wait to start The Shattered Sylph, which I quickly snagged for my Kindle even before I finished the last page in this one. 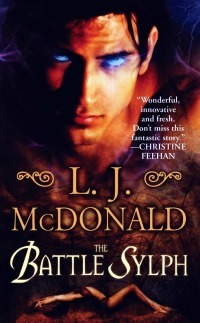 The Battle Sylph is a wonderful fantasy debut that left me happy to have come across it and thrilled to see what comes next. And very, very excited.